Mr. Aliyu Adamu, Mr. Hassan Tanko, Aisha Bello-Tukur all of Asset Management Corporation of Nigeria (AMCON); the District Head of Girei, Dr. Ahmed Ibrahim Mustafa, Ubandoma Adamawa; Mr. Usman Abubakar, Hiradi Malgwi and Jude Nwauzor when the AMCON delegation paid a courtesy visit to the District Head in Yola before the flagging-off of the distribution of Scholastic Materials for Mainstreamed Learners donated by AMCON to seven local government areas of Adamawa State north-east Nigeria. 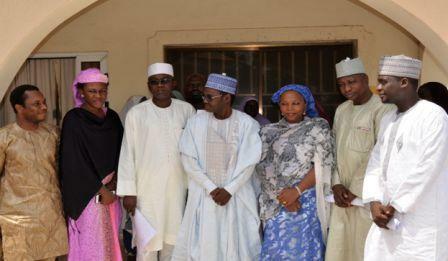 The Executive Governor of Adamawa State, Senator Mohammed Umar Jibrilla Bindo has commended the management of Asset Management Corporation of Nigeria (AMCON) for partnering with the government and people of Adamawa State towards the provision of educational materials and other support items especially for the Internally Displaced Persons (IDPs) in the state. The items AMCON donated to the state, which would be distributed to seven local government areas in the state include scholastic materials to Mainstreamed Learners and Parents Caregivers; starter packs for small scale businesses as well as food items for the affected families in the host communities. Speaking in Yola on Thursday when he received a team of AMCON officials who were in Yola to commence distribution of relief materials, Bindo said he was happy that AMCON support and association is coming at a time the incumbent government of Adamawa State under his humble self is also focusing a lot of attention to educational provision to children across the state, which he said was nearly destroyed as a result of insurgence in the Northeastern part of Nigeria. 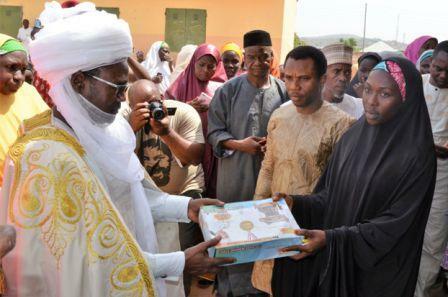 The District Head of Girei, Dr. Ahmed Ibrahim Mustafa, Ubandoma Adamawa (left), flagging-off of the distribution of Scholastic Materials for Mainstreamed Learners donated by Asset Management Corporation of Nigeria (AMCON) to host communities of the victims of insurgence in the North-Eastern state of Yola, Adamawa State at Girei 11 Primary School, Yola. Speaking in the same vein but at a separate meeting, the District Head of Girei, Dr. Ahmed Ibrahim Mustafa,Ubandoma Adamawa also commended the management and staff of Asset Management Corporation of Nigeria (AMCON) for coming to the aide of victims of insurgence and called on other well-meaning organisations in the country to do same. Dr. Mustafa who flagged-off of the distribution said such a gesture from AMCON who is collaborating with USAID – ECR) would go a long way to reassuring the beneficiaries, their families and the host communities that all hope is not lost. He said Girei, which AMCON chose to flag-off the exercise showed that the leadership of the Corporation led by Mr. Ahmed Kuru, Managing Director/Chief Executive Officer is in sync with history because Girei was indeed the first community in Adamawa State to accommodate thousands of Internally Displaced Persons (IDPs). According to him, the community gave up their schools, provided farm lands for the affected families among other supports, which helped the IDPs settle down in the state. He therefore thanked AMCON and the Education Crisis Response (ECR) team for the rare support and called on well-meaning individuals and corporate organisations like AMCON to continually donate to the rehabilitation of the affected individuals and rebuilding of the Northeast. Earlier, Mr. Usman Abubakar, who led the AMCON team and also represented the MD/CEO informed that the relief items donated by AMCON would be distributed to beneficiaries across the seven local government areas of the state. According to him, other local government areas that would join Girei include Fufore, Shelleng, Song, Numan, Yola North and Yola South where over 3,000 individuals would directly benefit from the items. He also charged the officials of ECR to ensure that the items are distributed as fast as possible so as to cushion the suffering of the beneficiaries.